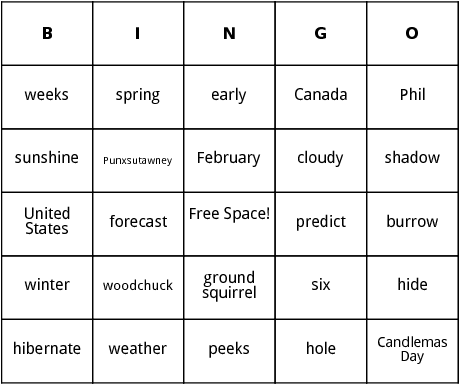 These Groundhog Day bingo cards are suitable for celebrating Punxsutawney Phil day. The main story behing ground-hog day, is that when the squirrel sees its own shadow, it means there are only 6 weeks left for the current winter. If the squirrel does not see it, then spring is arriving shortly. These fun bingo cards includepharses such as Canada,US, squirrel and more.